Facebook is now become one of the fastest platform of communicating and interacting with your friends and family all over the world. People use facebook for many purpose like sharing, connecting and explore new people, but one of the best feature facebook providing is photo sharing feature and people exchange their photo albums with their friends and family in many occasions and ceremony’s. Actually people loves to share their events photo albums online with their friends and family. 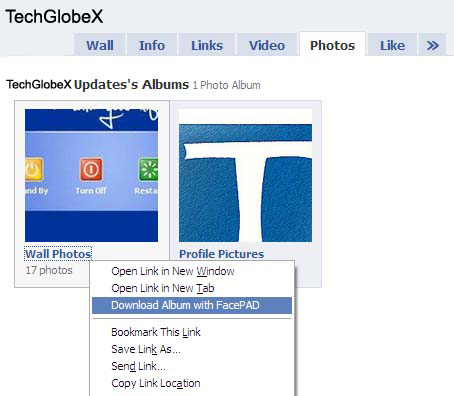 Many people are not aware how to download their and others Photo Albums simultaneously from facebook, so today i am going to share one of the useful Firefox Add-Ons which provides you facility to download facebook photo albums by just single click. You can download the pictures of an album by the simple right click option, but when the pictures are way too many it sometimes get hard to load them. So, by using this simple and effective Firefox Add-on photos can be downloaded and viewed easily. The name of this useful Firefox Add-On is "FacePAD". You can use "FacePAd" to download whole facebook photo albums by just a single click option and you're done! It’s simple and easy. In order to use this Firefox Add-On extension, first you have to download Firefox (if you don't have it). Then, Go here and download facePad. Restart Firefox. and you're done! Login to your Facebook profile. Goto the photos from which you want to download the album. Right Click on the album name to download it.